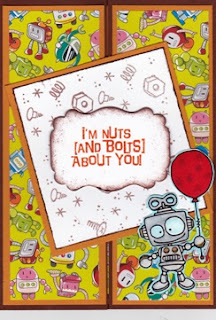 Sandy created an adorable card with a Robot with a balloon image. The paper she used is perfect!! And I love the sentiment. :) Thank you for sharing, Sandy! Make sure to visit her blog and leave a lovely comment for her!! This is really cute! I love the background paper too. That is so super - love it Sandy! !